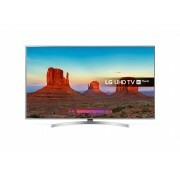 Leia parimad pakkumised tootele LG 70UK6950PLA (70 inch (178 cm) LED TV, 3840x2160 pikslit resolutsioon) ShopMania lehel. Võid osta LG 70UK6950PLA sadadest usaldusväärsetest veebipoodidest, mis postitavad üle kogu Eesti, millel on parimad hinnad tootele LG 70UK6950PLA. Loe ülevaateid ostjatelt meie sõpruskonnas, vaata LG 70UK6950PLA pilte ja saa teada selle omadustest. Ainult ShopMania lehelt leiad parimad allahindlused ja pakkumised, võrdle kategooria telerid pakkumisi ja osta madalaima võimaliku hinnaga LG 70UK 6950PLA teler ja tuhandeid sarnaseid tooteid. The 70 inch (178 cm) diagonal of this TV-set will let you enjoy your favorite sport events almost as if you were on the stadium, but the TV-set must be placed in large spaces, as small rooms are not recommended. Thanks to the LED technology, the LG 70UK6950PLA TV-set shows very clear images, excellent contrast and brightness, all with low energy consumption. This TV-set, with 4K Ultra HD image format allows you to enjoy a superior quality of the TV broadcast, as the images are rendered very close to natural, and the general feeling is that of a cinema theatre. With such a TV, you feel as if you are watching the game from the stadium of your favorite team and you can see any detail with amazing clarity and detail.